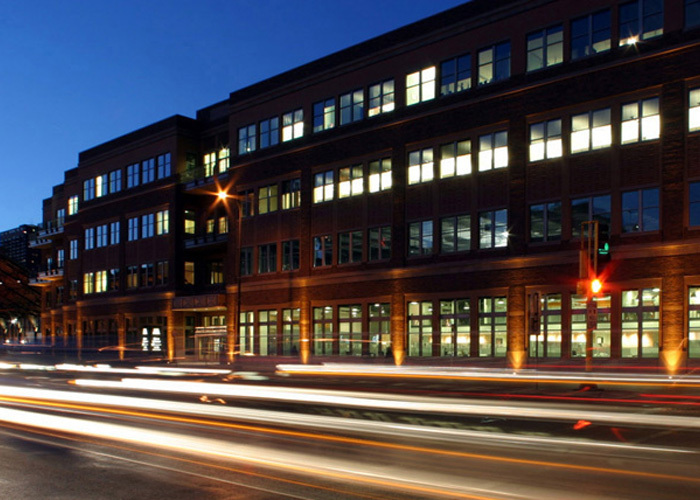 Located in the historic Mills District of Minneapolis, this 150,000 square foot mixed-use project incorporates office space on ground and upper levels with restaurant/retail on the street level and parking adjacent and below. The exterior entrance approach is recessed the full height of the building and leads into a vaulted lobby surrounded by large windows. The mezzanine in this area was an added feature inserted into the design during the construction phase. Structural systems include braced steel framing with composite metal deck and concrete floor slabs. Lateral forces are resisted by diagonal steel braces. 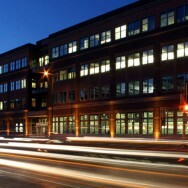 One of the building’s award-winning features is the three-level parking ramp, which is shared by Depot Office tenants and customers as well as tenants of the adjacent Metropolitan Lofts. The ramp was designed to meet regulations requiring it to be obscured from street view, which is done by partially tucking it into the building on the first floor. The overall structural system of the ramp is precast concrete on a conventional spread footing foundation. A sloped drive lane in the center of ramp uses precast bearing walls on each side. Precast double tees are used for the floor located inside the office building. Along the common wall of the office/parking area, the steel columns from the office building above were transferred out using steel transfer girders to maintain the required drive aisles for the parking area. An expansion joint was placed through the parking level along this line to isolate the office building from the thermal movements of the ramp. Ten-inch-thick precast bearing walls between parking and office on the east and parking and the lofts building on the north provide fire separation. Residential garages for some of the loft owners are built on top of the ramp’s double tee structure.